The Mekong provinces of An Giang and Kien Giang have worked together to efficiently use water resources, combat natural disasters and cope with their aftermath. Paddy fields in the Long Xuyen Quadrilateral. Kien Giang and An Giang signed an agreement in 2013 for water resource management in the Long Xuyen Quadrilateral with support from the Integrated Coastal Management Programme (ICMP). The agreement relates to water resource, flood and salinity control, water resources for irrigation and the responsibility of local authorities in implementing the agreement, Quang Trong Thao, deputy director of the Kien Giang Department of Agriculture and Rural Development, said at a recent conference on water management in the two provinces in 2013-2017. Situated in the west of the delta, the 498,000ha Long Xuyen Quadrilateral is bordered by the Vinh Te Canal, the Hau River and Cai San Canal. It is a major producer of rice and aquatic products. 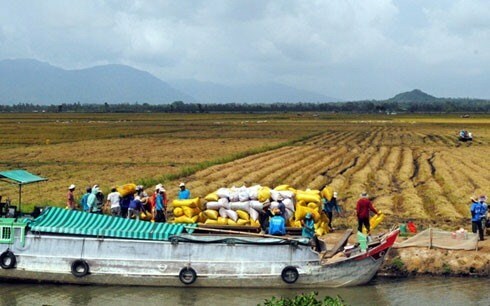 Under the agreement authorities have built the Tha La and Tra Su flood control systems in An Giang province’s Tinh Bien district, a flood control dyke along National Highway 1 from Chau Doc to Ha Tien, a flood control system along the Hau River, dykes and rainwater drainage and saltwater control systems along the coast, Grade 1 and 2 canal systems, an urban flood control embankment, and an embankment for agricultural production and flood control in An Giang and Kien Giang provinces. The well-funded and -operated irrigation works in the Long Xuyen Quadrilateral have helped control flooding and saltwater intrusion and provide water for locals’ daily needs, irrigation and river traffic. An Giang and Kien Giang have also agreed on the annual release of water from the Tha La and Tra Su dams between late August and early September to irrigate the summer-autumn and autumn-winter rice crops, mitigate flooding in the upper section of the river, wash away salt and disease-causing pathogens and deposit alluvium. In 2018-20 a recent agreement on water management in the quadrilateral will be implemented, with Hau Giang province and Can Tho city joining Kien Giang and An Giang.